On Memorial Day, I ran my first ever 10k. Since there wasn’t an actual race on Memorial Day, we made our own faux race on a new section of greenway here in Cary. My farthest previous distance was 5k, or 3.106 miles, so this was surprising, to say the least. To celebrate this victory, we had lovely grilled burgers with ground beef from a local farm, Black Hoof Run Heritage Beef. We hadn’t made hamburgers in a loooong time, and they were so incredibly delicious! Are you wondering what the big idea is about grass-fed beef? Is it just another trendy foodie fad? Another way to part you and your precious paycheck? Click HERE for a primer on grass fed beef. Not only does grass-fed beef taste better, it is lower in bad fat and higher in omega-3 fats (good fat). With our delicious grass fed burgers, we treated ourselves to one of our favorite condiments, bacon-onion marmalade. This is basically a caramelized onion reduction with bacon and it is very delicious. We made this with locally produced onions and locally and humanely produced bacon from Mae Farm. I cannot possibly say enough good things about the pork we have purchased from Mae Farm. It is always incredible. Yes, bacon is not health food, I do realize that. But what you end up using is in such small quantities that any health effects of the bacon fat are pretty negligible. If you like bacon and caramelized onions, you will love this-it is sweet, onion-y, tangy and rich. Just the way to celebrate a super day! Looking for a Deviled egg recipe? Click HERE! In a saute pan, cook the bacon until crispy. Remove the bacon and reserve, but keep the bacon drippings. Add sliced onions to the bacon drippings and cook on medium-high for about 10 minutes, until all onions are soft and translucent. Reduce heat to medium-low and add all remaining ingredients to the pan. Stir to combine. Simmer until mixture is almost out of fluids and is thick and jammy–about an hour. Reduce heat to low and cook another 10 minutes until mixture is very brown and sticky. You may need to add a bit of water if the mixture is too dry. Serve what you need and refrigerate the rest in a covered container for up to 2 weeks. YUM! What a great way to “fancy” up a burger. And now I want a deviled egg! 🙂 I love a burger, but I’ll take a deviled egg over a burger any day! I am so far behind. Yay for the faux 10k!! And I am so making this!!!!! And I’ll probably post it. Is that cool? Because I love it. I forgot to send you the info from the lady I met in Asheville! I need to get it together. But this burger? It is AWESOME. They were so good–prob because we hadn’t eaten beef in about 8 weeks! I actually used the leftover chicken dry rub from your recipe in the burgers. Yes, please post! I appreciate it! Love the marmalade idea…we will try this one- thx. Yum! 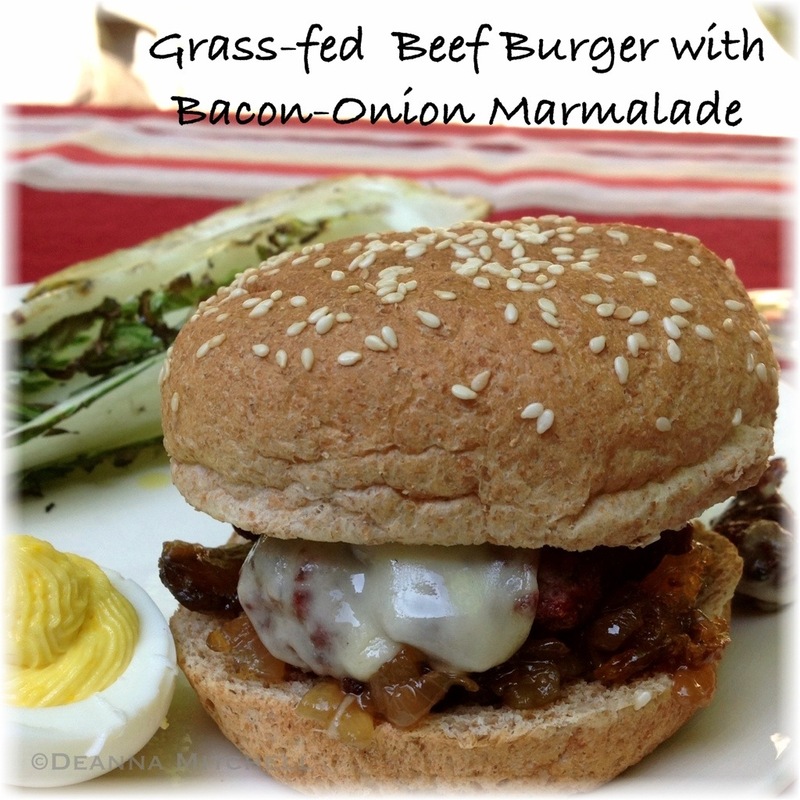 Love Carmelized onions on burgers (and everything else too! ), but adding bacon is over the top delicious!! I’ll be making this. Congrats on your 10k!! Thanks! And I hope you like the marmalade! It’s awesome on grilled fish, too. Thanks for the mention, Heather!